Ever run out of power midway through a job and been bogged down with the hassle of refuelling? Never again, with an electric water pump available from SGS Engineering. Pump clean and dirty water for a quick and efficient clean up using a powerful electric submersible pump from our range. If you live in an area that experiences flooding or is at high risk, an electric submersible water pump is a vital piece of kit to own. A variety of different options can be found to suit various situations and needs - take a look at our product range below. Which electric water pump should I choose? From large to small, most of our electric water pumps for sale are suitable for a variety of domestic and professional purposes. With clean and dirty water options available, whether you need a pump to clean up after experiencing a flood or for draining a garden pond, you can find it in our range. 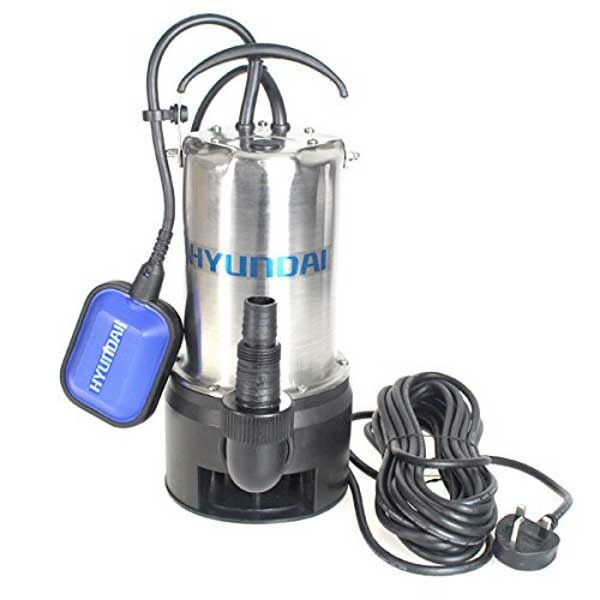 All of our electric pumps for water come from reliable manufacturers, including Hyundai. They all feature handles for portability and are fitted with a regular 13A plug so you can use your new water pump kit with a standard mains power socket. Can I purchase my new electric water pump online? Browse our range of powerful electric water pumps for sale to find one that will best suit your personal or professional needs. Accessories such as water pump hoses are also stocked, to make your water clearing jobs even easier. Every electric water pump comes with a two-year warranty, 60-day hassle-free returns policy and UK next day delivery for orders placed before 4pm. Shop our collection and discover the perfect electric submersible pump for your job today. When dealing with electric pumps for water or any kind of outdoor equipment, it can be difficult to know precisely which model suits the task you have in mind. At SGS, we are committed to ensuring that you have all the information you need to make your next purchase and have prepared several how-to and buying guides to help you on your way.